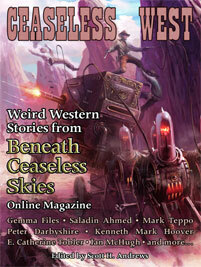 These and other awe-inspiring Weird Western stories await in Ceaseless West: Weird Western Stories from Beneath Ceaseless Skies Online Magazine, a new ebook anthology of eighteen Weird Western stories from Beneath Ceaseless Skies. Ceaseless West features stories by Kenneth Mark Hoover, Peter Darbyshire, Mark Teppo, E. Catherine Tobler, Aurealis Award finalist and winner Ian McHugh, Shirley Jackson Award finalist Gemma Files, and Hugo Award finalist Saladin Ahmed. Ceaseless West: Weird Western Stories from Beneath Ceaseless Skies is available for only $3.99 in five different ebook formats, including for Kindle, Sony Reader, Palm, Barnes & Noble Nook, and iPhone/iPod Touch/iPad. Read it on your e-reader, smartphone, laptop, or tablet. All proceeds from the sale of Ceaseless West go to pay BCS authors and artists for their work. Buy a copy to read great literary adventure fantasy and support Beneath Ceaseless Skies.